13 exclusive action figures from the Star Wars saga! Figures from the Ralph McQuarrie Concept Art Collection from the 30th Anniversary Action Figure Collection. Based on original trilogy pre-conceptual sketchbook designs. Some of the best and most unique action figures of all time! An exciting Shared Exclusive! 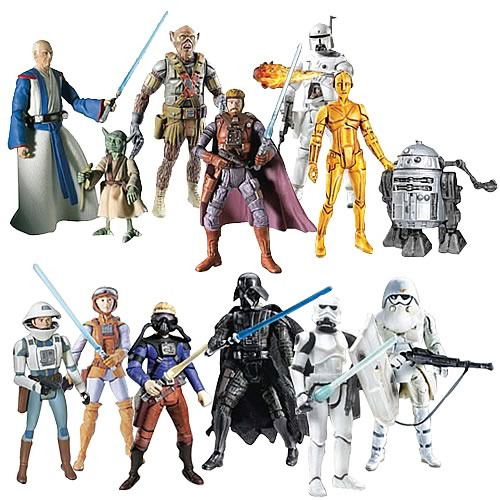 Get all 13 of the 3 3/4-inch scale action figures based on the Ralph McQuarrie Concept Art Collection from the 30th Anniversary Action Figure Collection in this one great set! Based on the pre-conceptual designs from the original trilogy, these characters include awesome accessories and are shown as they appeared in the sketchbooks for Star Wars and The Empire Strikes Back. Bring home some of the best and most unique action figures of all time! Accessory footnote: Obi-Wan Kenobi includes lightsaber. Yoda includes cane. Chewbacca includes rifle. Han Solo includes cape and lightsaber. Boba Fett includes blaster pistol. Rebel Trooper includes two-piece helmet, armor, and blaster. Starkiller Hero includes blaster, helmet, backpack, and breathing gear. Luke Skywalker includes blaster, lightsaber, breathing mask, and backpack. Darth Vader includes lightsaber. Stormtrooper includes lightsaber. Snowtrooper includes rifle. Figures do not include coins, alternate heads, and some other items from the original releases.